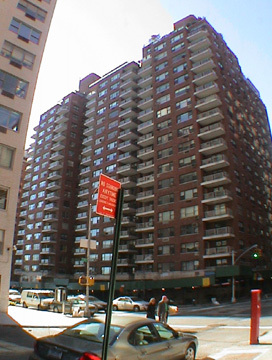 This 22-story apartment building occupies the west blockfront of Sutton Place South between 54th and 55th Streets and its red-brick facade with many balconies is a handsome mate to the rather similar building just to the south across 54th Street, 60 Sutton Place South (see The City Review article). With their many balconies and white trim, both buildings are rather cheery and quite pleasant in their rather liberal and "modern" take on Colonial style. The impact of "Modernism" and its emphasis on clean lines and a "white" pristine look after World War II resulted in the proliferation of many "white-brick monstrosites," which did not arouse much ire at the time because of a general "cultural" enthusiasm for the "new" style. The Sutton Place ambiance here is superb: quiet, understated and elegant. Although some of the riverfront properties here have their own impressive gardens, there is a nice, small park at 54th Street overlooking the river as well as another at the terminus of 57th Street where there is also a crosstown bus stop.